Five years ago, the collapse of investment banking firm Lehman Brothers ushered in the biggest financial crisis since the Great Depression. What may not be as vividly remembered is how the economic disaster that occurred just weeks before Election Day changed the media’s campaign coverage, and perhaps the outcome, of the presidential race. Pew Research Center data analyzing the tone and focus of media coverage through the final stretch of that election showed how that coverage shifted dramatically in mid-September 2008 to focus on the financial crisis and the media narrative grew increasingly critical of Republican candidate John McCain. During this same period, our public opinion survey data indicate that what had essentially been a deadlocked contest between McCain and Obama before the Lehman meltdown turned into a solid lead for Obama in the weeks that followed. To understand how the financial crisis transformed the focus of campaign coverage, it’s worth remembering that during the week of Sept. 8-14, the political press was fixated on the buzz surrounding Sarah Palin, McCain’s surprise pick for running mate. That week, Palin accounted for half of the overall campaign coverage while economic issues were far behind, at only 4%. By the following week, (Sept. 15-21), however, the financial crisis would surge to become the top campaign storyline, accounting for 43% of campaign coverage as both candidates scrambled to deal with the new economic reality. From that point until Election Day, the economy and the financial crisis remained the top storyline in coverage of the presidential race. The media’s newfound focus on the economy as a central campaign issue also coincided with increasingly unflattering coverage of McCain. 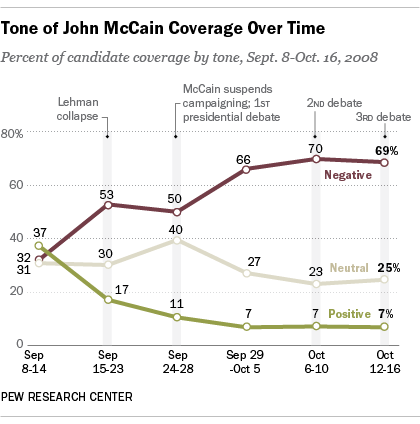 The week before the Lehman Brothers collapse, McCain was benefiting from a post-convention bounce that was reflected in the tone of his media coverage. From Sept. 8-14, 37% of campaign narrative focused on the senator was positive in tone, while 32% was negative (another 31% was neutral). But some apparent tactical missteps—including his statement that the “fundamentals of our economy are strong” and his decision to suspend his campaign—became part of a worsening political narrative for McCain. And in the period immediately following the Lehman bankruptcy, Sept. 15-23, the tone of his coverage grew much harsher: Only 17% was positive compared with 53% negative and 30% neutral. Overall, during a five-week critical stretch of the campaign, negative coverage of McCain (57%) outweighed positive coverage (14%) by about four-to-one. Barack Obama’s, by contrast, was more positive (36%) than negative (29%). It’s difficult to know the exact impact of the financial meltdown and the ensuing press coverage on the outcome of the race. But the polls may help shed some light. According to Pew Research Center public opinion surveys, McCain had trailed Obama for much of 2008, but by the week of Sept. 9-14, in the aftermath of his convention, he had pulled even with Obama among likely voters. In every Pew Research Center survey taken after the financial crisis of mid-September, McCain trailed Obama by no less than six points. And in one particularly telling poll taken within a week of the Lehman Bros. bankruptcy, fully 30% of those surveyed said their opinion of McCain had become less favorable in the past few days, while only 20% said their view had become more favorable. On Nov. 4, McCain lost to Obama by seven points.